In Felix, 11-5 to 11-11-1934, the homeless cat tangles with a snake charmer and a real snake, and figures out how to get a free meal from the mind reader, Madame Seezall. Felix has found a new home in the Sunday page and makes friends with a new little boy, but accidentally lets a flock of Messmer owls into the joint in the last two panels. Myrtle this week is from 8-9 to 8-15-1948. The 8-10 episode originally appeared on my birthday, 67 years ago. Lots of good Bingo gags this week, and Hyacinth the cat dominates the 8-14 as she puts the grip on Bingo’s tail through a hole in the fence. Watch for her in the “Our Ice Cream Social” Sunday page, as she again attacks Bingo’s tail, starting to tie a big knot in it. Krazy is all about Kommandos in the strips from 11-16 to 11-21-1942. The word “kommando” in German means “Unit” or “Command”, but was sort of re-defined in English as an undercover soldier or spy. Offissa Pupp, Ignatz and possibly Krazy are in disguise for most of the week. The War subtly enters Coconino again, but Garge doesn’t take it too seriously. 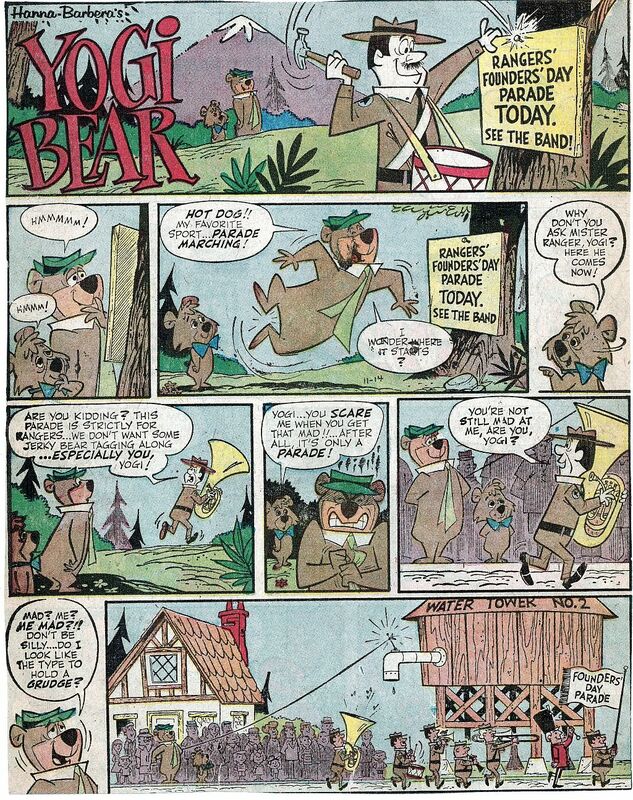 Here’s the penultimate appearance of Yogi Bear in this blog! In the November, 1965 Sunday pages, Yogi plays baseball with Huck, Quick Draw, Boo Boo and Baba Louie in the November 7th episode. That’s a great pose in the 5th panel as Yogi swats the ball, but a rather strange result as he supposedly smashes the bottom of a glass bottom boat with the fast moving spheroid. That would have to be some crazy hit to loop around and smash the glass bottom from the top! Ranger Smith appears in the 11-7 and 11-14 strips and his wife appears in the 11-28, featuring another tiny bit awkward gag as Yogi puts in strings of lights for the Ranger Ladies Annual Outdoor Dance. Mrs. Smith and the other girls look like typical Hanna-Barbera women, probably Iwao Takamoto’s designs. 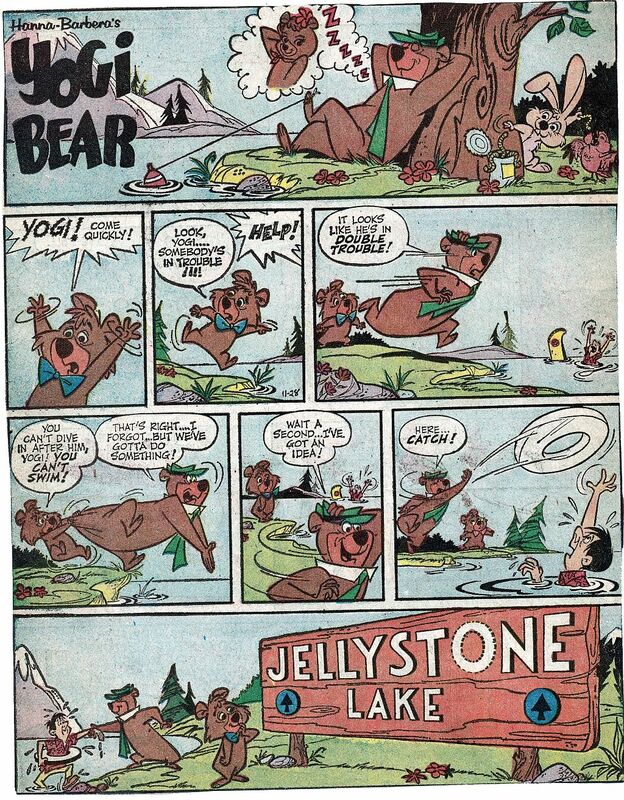 The 11-28 really looks like Willie Ito’s drawings, as Yogi dreams about Cindy Bear in the first panel. The Bunny, Owl and drowning man also look like characters that Willie could have designed. Sometime next month I’ll post the last Yogi Sundays that I cut out of the St. Louis Post-Dispatch in December of 1965. Yowp has tapped into a New York newspaper site that has beautiful copies of the half-page Yogi Bear Sundays in black and white, so from now on visit his blog for more adventures of that braggin’ bruin. His address is www.yowpyowp.blogspot.com. Itza Cat and I will be at the Ojai Film Festival in Ojai, Ca. on November 7th, 2015. We will be presiding over an Animation Workshop at the Art Center Gallery. For more info go to http://www.ojaifilmfestival.com/workshops/. The great Jim Keeshan (he’s related to Bob Keeshan of Captain Kangaroo and Clarabelle Clown fame) will be interviewing me about my career. We’ll be showing a lot of animated cartoon clips from stuff I’ve worked on since the early 1970s through 2011. So if you are around there on Nov. 7th, please drop by, it’s only 15 little dollars. A dear friend of Itza Cat’s, and a cherished Ailurophile, a wonderful lady named Ronnie Scheib has left us. She and her S.O. Greg Ford, struggled against her cancer and fought it off for awhile, but eventually poor Ronnie succumbed to it. Ronnie was a good friend for many years and dearly beloved by Greg, who was constantly at her side for the last several years both in the hospital and at home. Ronnie had one of those soft New York accents that was very pleasant to listen to, a bit like Harpo Marx’s speaking voice by some accounts. She was a very good film reviewer, she and Greg collaborated on many columns for Daily Variety for a number of years, you may still find some of her by-lined reviews on-line. Ronnie travelled to many film festivals to see cinema for her columns, often working from hotel rooms and “faxing” them in to Variety. Her knowledge of cartoons was vast, she loved them almost as much as Greg and I did. She appears on camera in the documentary FORGING THE FRAME, which Greg Ford produced and is on Popeye the Sailor DVD Volume One 1933-1938 on Disc #2. I’m so glad she participated in this one, as her on-camera appearances were rare. She sits on a beautiful overstuffed chair and comments on Winsor McKay, Felix the Cat, Koko the Clown and many other early New York animated personalities. She holds her own quite well alongside such animation wiseguys as Michael Barrier, the late Michael Sporn, Mark Langer, John Canemaker and many others. Itza and I will miss you, Ronnie, wherever you are. Thanks for your support and encouragement over the years. We love you! 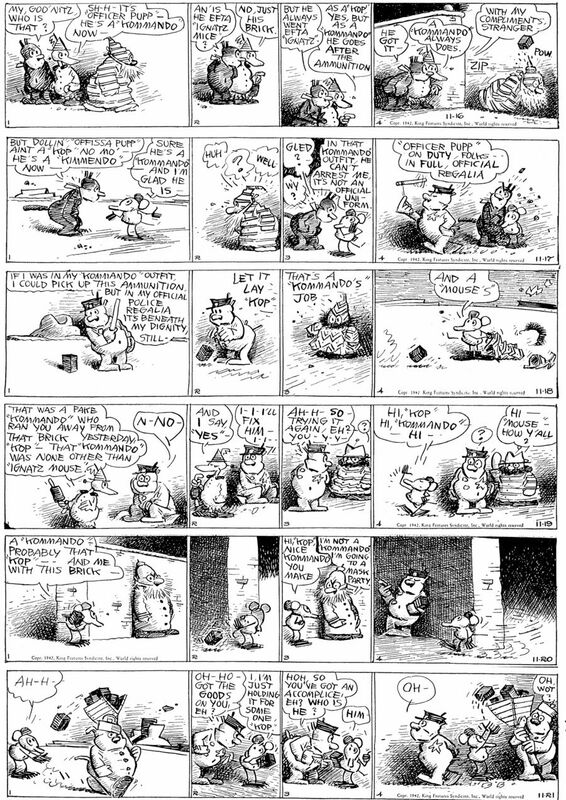 You are currently browsing the Mark Kausler's CatBlog blog archives for October, 2015.